Kik is a cross-platform mobile application used for instant messaging. Like many other popular messaging apps, such as Messenger and Snapchat, you can use Kik to message individual friends as well as groups of friends. Unlike WhatsApp, which uses your phone number to create your account and connect to your contacts, Kik allows its users to create a free account by email and password. 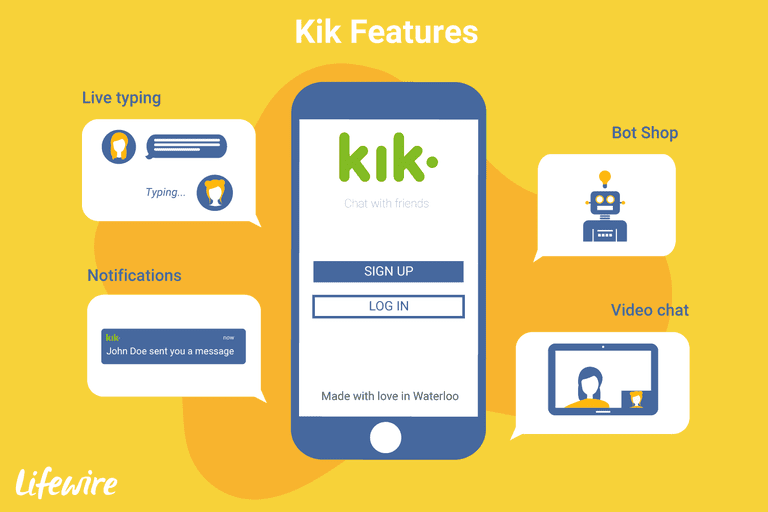 Users can connect with each other by searching for a particular user's username, scanning a Kik code, or using their phone contacts by entering their phone number. With Kik, you can send and receive an unlimited number messages to anyone else who has a Kik account. It looks and feels nearly identical to SMS text messaging, but it uses your smartphone's data plan or WiFi connection to send and receive messages. A lot of teens and young adults love Kik for its intuitive and functional app interface that makes it easy to chat about anything as if they were doing it via text message. A Kik user might say, "Kik me" followed by their username, meaning that they want you to add them to your Kik contacts so you can both chat on the app. Since the majority of Kik users are quite young, it's been pegged as a possible friendship and dating app (similar to OKCupid and Tinder) for its ability to help users meet new people. There are however some limits considering you have to add everyone manually by their username (besides the contacts you import from your device). Kik is a great substitute for regular SMS text messaging, often as a way to avoid expensive data charges or to avoid going over any text limits. The biggest downside to using Kik is that you always have to use your data plan or connect to WiFi in order to use it, but for mobile devices users who are limited by texting, Kik is a great alternative. Kik also allows more than just simply texting. Chatting online is highly visual these days, and Kik allows users to message their friends with everything from photos and videos, to GIFs and emojis. Within just over two years of its release in 2010, the Kik Messenger app grew into one of the best and most popular chat platforms available, attracting over 4 million users–called “Kicksters.” By May of 2016, it had over 300 million users. Kik was built to mimic the look and functionality of smartphone SMS text messaging, except of course it works with user profiles and username to chat with friends as opposed to phone numbers. Here are some of the features you can expect to get out of using it. Live typing: You can see whenever the person you're chatting with is typing a message live, which is helpful in knowing that you should be expecting to receive a message back within a few seconds. You can also see when a message you've sent has been read by the recipient, even if they haven't replied yet or started typing. Notifications: When you send and receive messages, you are notified when they're sent and delivered, just like regular text messaging. You can also customization your notification sounds and choose to receive them instantly whenever a new friend sends a message to you. Invite friends: Kik can send out invites to people you know by SMS text, by email, or through social networks like Facebook and Twitter. When a friend signs up for Kik with their phone number or email that you already have saved on your phone, Kik recognizes that you’re friends and sends you both a notification to connect on Kik. Bot Shop: Use Kik's bots to get more social. You can chat with them, complete fun quizzes, get fashion tips, read the news, receive advice and more. Kik code scanning: Every Kik user has a Kik code that can be accessed from their settings (the gear icon in the top left corner of the chats tab). To add a user from their Kik code, tap the search icon, then tap Find People, then tap Scan a Kik Code. You have to give Kik permission to access your camera before you can scan another user's Kik code to add them. Multimedia message sending: You aren’t just restricted to sending text messages with Kik. You can send photos, GIFs, videos, sketches, emojis and more! Video chat: A new feature Kik recently introduced includes the ability to have a real-time video chat with friends, similar to FaceTime, Skype and other video chat apps. Profile integration: You have your own username and account, which you can customize with a profile picture and contact information. Chat lists: Like any smartphone SMS text platform, Kik lists all the different chat you have with people. Click on any to pull up the chat and start chatting with them. Chat customization: You might notice that Kik closely resembles the look of Apple's iMessage app. You can choose what colors you want for your chat bubble. Group chats: You can start your own group chats by tapping the search icon (the little magnifying glass), tapping Start a Group and then adding users to your group. Promoted chats: When you tap the search icon to add new people, you should see an option on the next tab labeled Promoted Chats. You can tap this to see a list of interesting chats and start chatting with them yourself. Privacy: You can choose whether or not you want Kik to access your address book to match it with your contacts. You can also block users on Kik from contacting you. To get started, the first thing you need to do is download the free mobile app. You can download Kik Messenger from iTunes for iPhone (or iPod Touch or iPad) or from Google Play for Android phones. Again, the major drawbacks are the need for a data or WiFi connection, along with the need for friends to also have a Kik account if you want to interact with them through Kik. Still, it’s a great messaging option that has been growing steadily in popularity over the years, especially with the younger crowd.